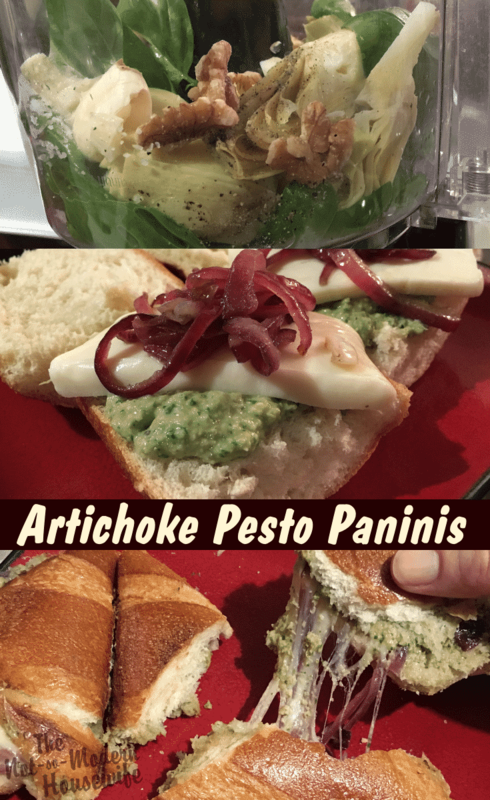 I love artichokes, so I found it really interesting that this panini sandwich recipe incorporated them into a pesto. The original recipe called for fresh parsley, but I used basil instead. I tend to prefer basil over parsley for flavor, and I didn’t have any parley on hand. I also didn’t have ciabatta, so I used French bread. I used pita bread for my leftovers, so either are good choices. I also used half as much red onion (the original recipe called for one whole onion) because Hubby thinks onions will kill him. I always enjoy the recipes I get from The Six O’Clock Scramble, and this panini is no exception. The Scramble is a meal planning service that provides a fully customizable menu and grocery list every week. The service is geared towards those of us who have a limited amount of time to cook every night, so most of the recipes can be completed in less than 30 minutes. Cook and prep time for this dish is 25 minutes. Heat 1 Tbsp olive oil in a skillet over medium heat. Saute the onions and a pinch of salt over medium heat until they are tender and starting to brown, 7-10 minutes. Add red wine vinegar during the last couple minutes of cooking. 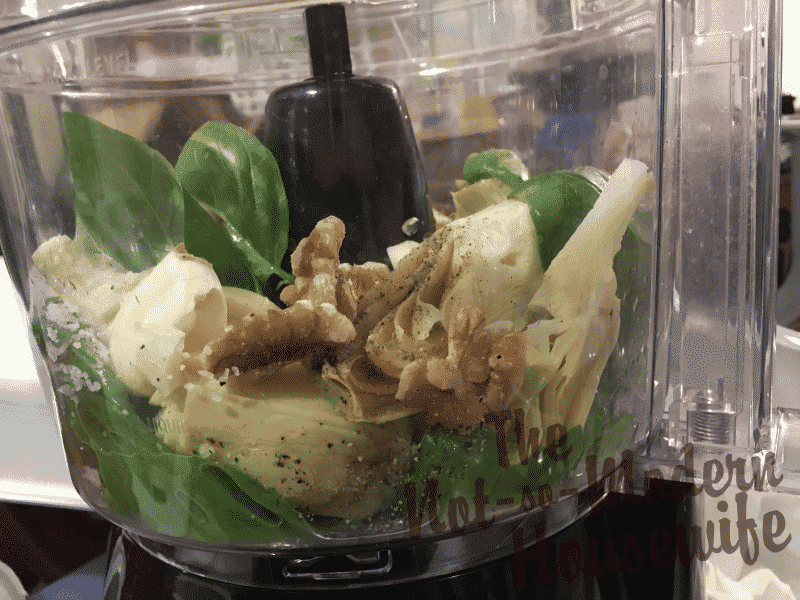 In a food processor, combine artichokes, 1/4 c olive oil, garlic, basil, walnuts, lemon juice, 1/4 tsp salt and pepper. Blend until smooth. Heat a sandwich press or heavy skillet. 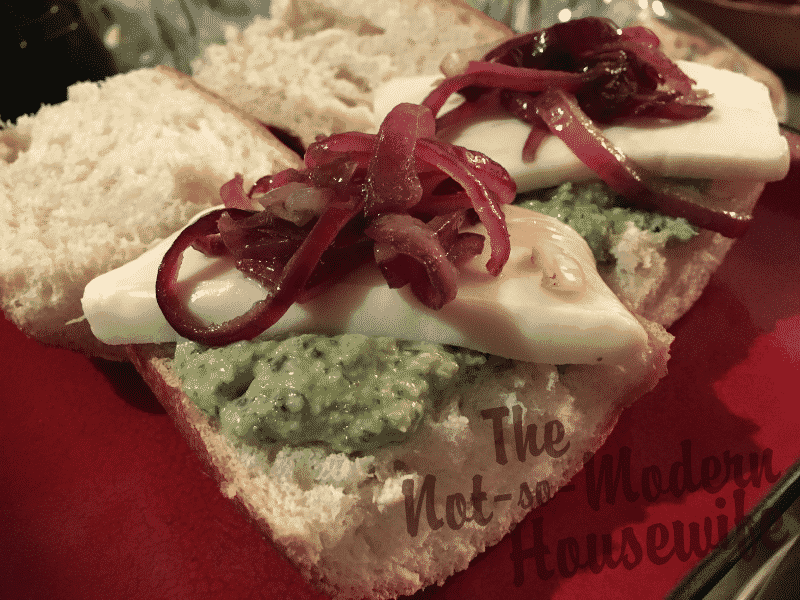 Spread a spoonful of pesto on a slice of bread and top with mozzarella cheese and onions. Place another slice of bread on top. If using a sandwich press, loosely wrap the sandwich in foil. 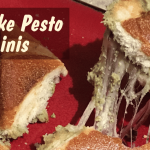 Grill or press the sandwich until the cheese is melted and the bread starts to brown, about 2 minutes per side of grilling or 2 minutes total in a sandwich press. Thank you so much for sharing my recipe from The Six O’Clock Scramble meal planner! I’m thrilled you loved it enough to post about it! Thanks so much for stopping by. I’ve tried a few different menu planning services, but yours is by far my favorite. Great recipes and I love how accessible it is from my phone. I’m planning to post a full review soon. Keep up the great work! 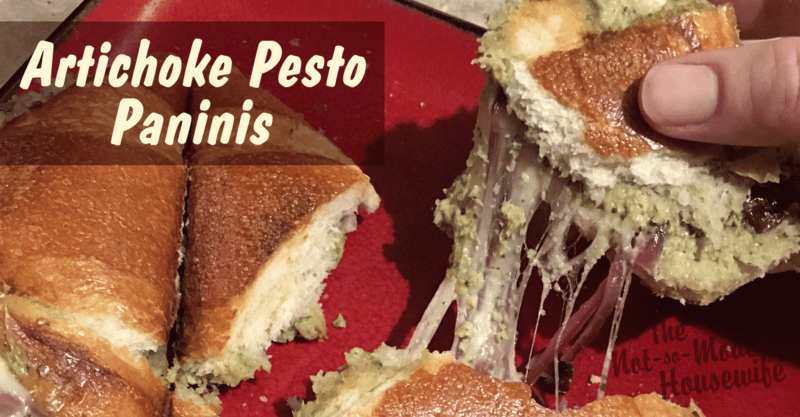 Oh my goodness…I love Panini’s and this looks delicious. Thanks for linking to the Homestead Blog Hop this week!